What a man! He is so quiet and unassuming, and was wearing such a super casual outfit of jeans, a hoodie and what l think was a corduroy jacket, that I didn’t even realise it was him at first. Unlike some stars, who don’t have nearly as much clout in Hollywood as he does, Joss stopped to chat to every news outlet and was polite, charming and engaging with everyone. We talked about Much Ado About Nothing, which I am so excited about and have posted about before. When I asked him why he didn’t just go on holiday like a normal person after finishing The Avengers, he said his wife insisted he make the movie because she knows he is happiest when he’s working. He had so much praise for his cast, [comprised of his friends and frequent collaborators] and was cautious about all of the love it’s getting from festivals, saying he’ll wait for the viewing public to judge it. Of course he refused to give any Avengers 2 spoilers but Joss admitted he’s both relaxed and nervous about the sequel, because the first movie was so well received. While we were chatting Kim Kardashian walked along the red carpet behind Joss and the screams were deafening. 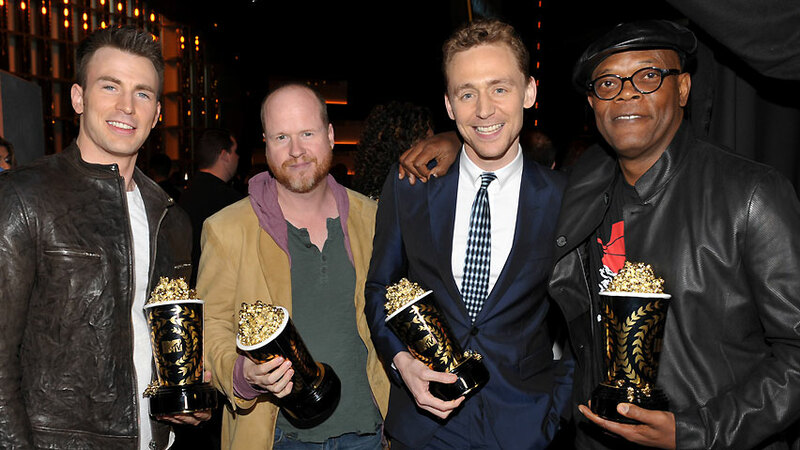 It’s kind of sad that the genius of Joss wasn’t recognised in the same way but considering Avengers took home three awards, Best Fight, Best Villain, and Movie of the Year, I doubt he cared. This entry was posted in Gossip and tagged Avengers 2, Best Fight, Best Villain, Chris Evans, Joss Whedon, Kim Kardashian, Movie of the Year, MTV Movie Awards, Much Ado About Nothing, Samuel L Jackson, Tom Hiddleston. Bookmark the permalink.